Today I was there for Gov. 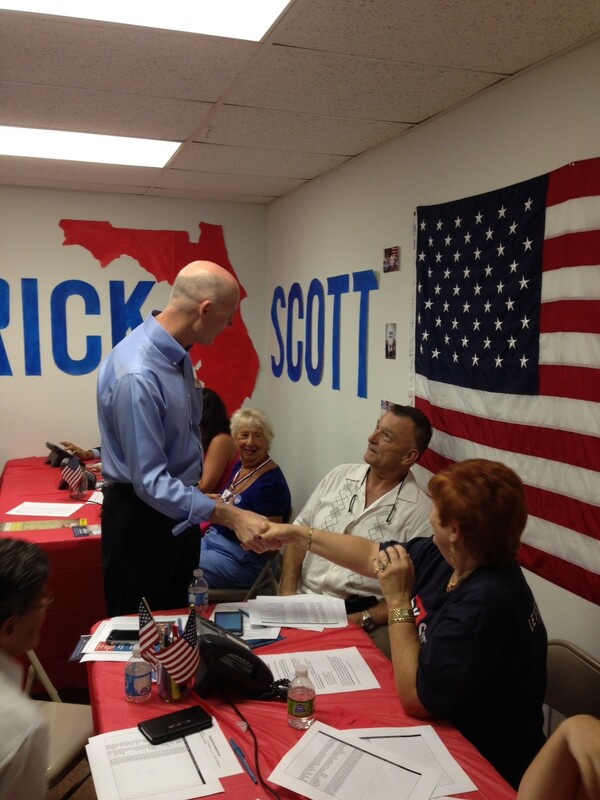 Rick Scott’s visit to the Sarasota GOP Victory office. 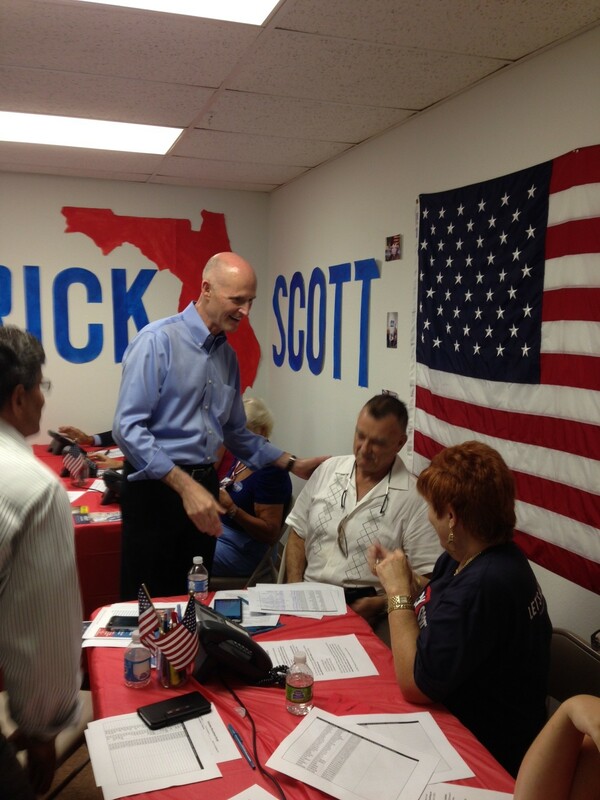 Governor Scott greeted the thanked the volunteers and gave a quick speech before going out to knock on doors in Sarasota. We came up short on election day but ran the best campaign we could. Thanks to everyone who has helped me along the way during the campaign – whether you’ve donated, volunteered, sent prayers my way, or helped in any way whatsoever, I really appreciate it from the bottom of my heart. I know that we all worked the hardest we could and I’m so grateful for all of the hard work that so many of you have given me, my family and this campaign. I called Dr. Gonzalez shortly after the polls closed to congratulate him and offer him my endorsement and support. 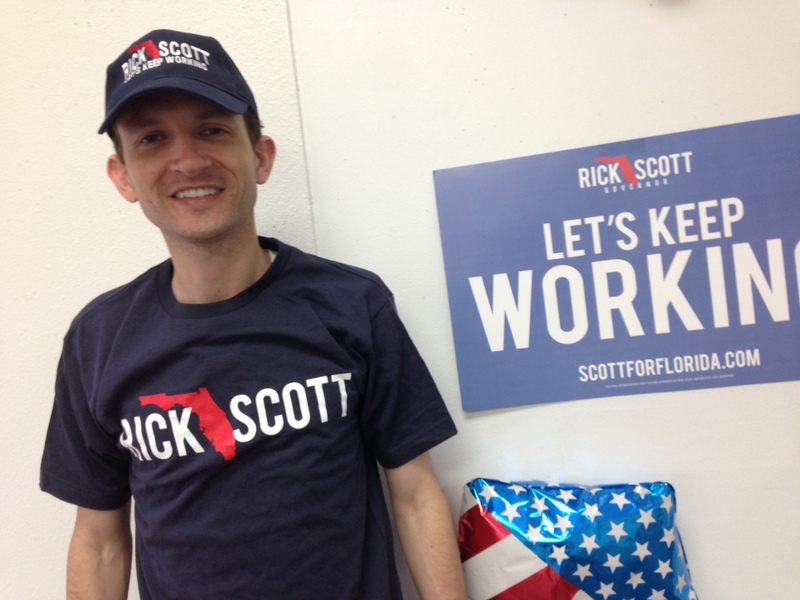 Now it’s important that we all work together to gain a Republican supermajority in the Florida House and Senate and reelect our Cabinet members and Governor Rick Scott. 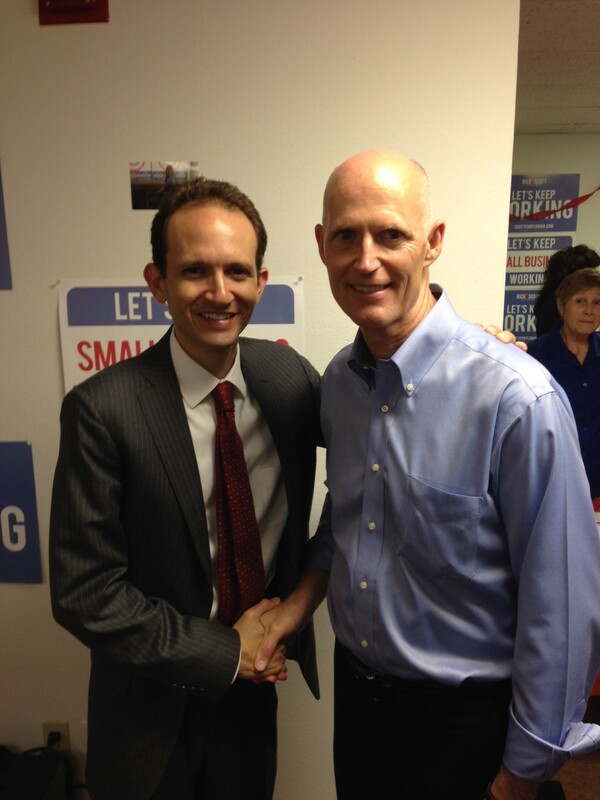 Governor Scott called me on Wednesday to ask that I stay involved in the Republican Party and I pledged to do everything I could to help him win reelection. Thanks to all my supporters and friends for everything ! It was a tale of two elections in the House District 74 election. Venice doctor Julio Gonzalez defeated Richard DeNapoli on Tuesday night, winning 57 percent of the vote in the most hotly contested Republican Primary in the region. But it wasn’t as one-sided as the results show. Election results show DeNapoli beat Gonzalez in the absentee voting that started at the end of July. DeNapoli was winning 53.2 percent of the absentee ballots. 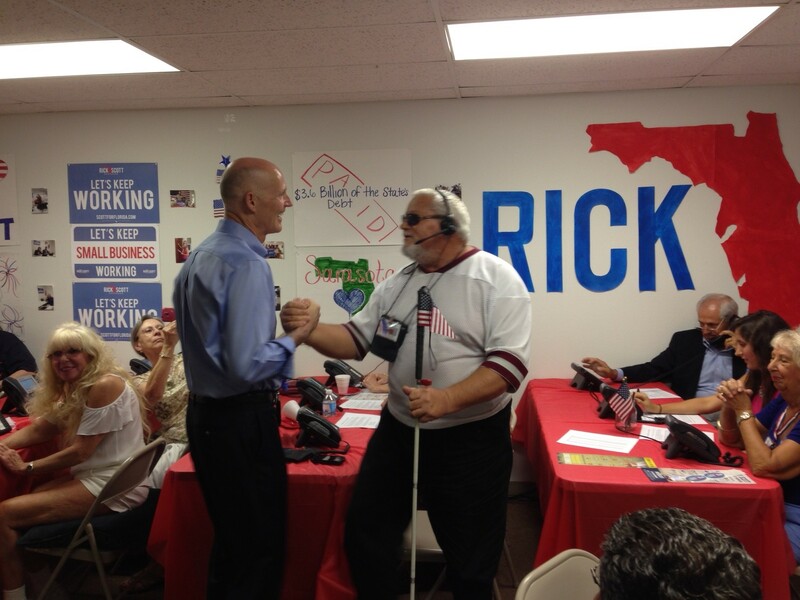 DeNapoli prided himself on getting out and going door to door months before Gonzalez went out in full force. DeNapoli’s aggressive early campaign with Gonzalez’s campaigns slow ramp up likely contributed to that results. But Gonzalez erased most of the gap in early voting that started Aug. 16. When polls opened on Tuesday and after weeks of television ads and mailers, Gonzalez was up, but he and DeNapoli were separated by just 138 votes. Gonzalez won nearly two out of every three Republican voters on Election Day. That 138 vote margin ballooned to almost 2,000. Undoubtedly, U.S. Sen. Marco Rubio will get a lot of credit for Gonzalez rebound. Rubio cut a television commercial supporting Gonzalez that was airing non-stop in the closing days of the election to help drive turnout. Gonzalez benefitted from a strong endorsement from U.S. Sen. Marco Rubio, a Miami Republican, down the stretch. Rubio made television ads that blanketed Sarasota in an effort to help Gonzalez. “I am forever indebted to him,” Gonzalez said. DeNapoli, who called Gonzalez to concede and endorse him, said he had no regrets. He said he didn’t have the money to overcome the outside political committees that helped Gonzalez. …in the state House District 74 primary battle between Republicans Julio Gonzalez and Richard DeNapoli, voters in Venice and North Port took opposing approaches. DeNapoli won in North Port with 51 percent of the vote. But Venice favored Gonzalez, with 64 percent of the vote. Because turnout was much higher in Venice, Gonzalez won the seat, despite losing North Port, the county’s largest city. …DeNapoli and [Shannon] Snyder [a County Commission candidate] showed that while North Port can break differently than other parts of the county, winning there is not yet enough to build a victorious campaign because of how much lower voter turnout is there compared to areas like Venice. Though North Port has 59,000 residents, only about 5,800 voted Tuesday, even though it had two big City Commission races, three School Board races and a premier state House race on the ballot. In Venice, which has 21,000 residents, almost 3,800 voters turned out. [Republican Party County Chairman Joe] Gruters said if North Port residents took advantage of their potential political power, they could dominate county politics. …Gonzalez said he was pleased DeNapoli had called to congratulate him. “He was very cordial and gracious and he wished me a lot of success and I’m very grateful that he called and expressed his well wishes,” he said.